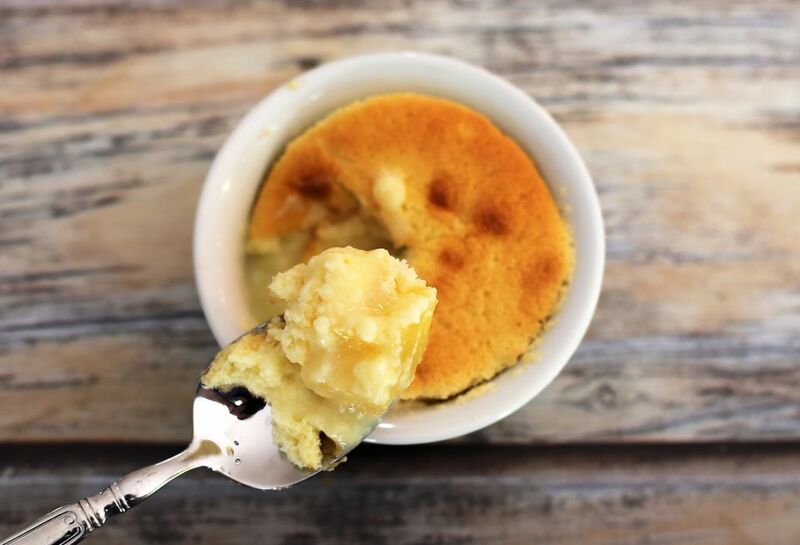 This pineapple custard pudding cake is baked in individual ramekins with pineapple chunks in the bottom and a soft, fluffy cake topping. It's not too sweet and gets a bit of pleasant tartness from the lemon juice. Beaten egg whites give the pudding cake its signature light, spongy texture. As a pudding cake bakes, the cake part rises to the top, leaving a wonderful custard sauce on the bottom. You'll want to serve this cake with spoons. This light and fluffy cake will quickly become a family favorite. Lightly butter six custard cups or ramekins. Drain the pineapple chunks over a bowl; set the syrup aside. Put equal portions of pineapple chunks into the custard cups. In a mixing bowl with an electric mixer, beat the egg whites to stiff peaks; set aside. Beat the egg yolks in a separate bowl. In a mixing bowl, combine the sugar, flour, and salt; add 2/3 cup of reserved pineapple syrup, lemon juice, peel, beaten egg yolks, and melted butter and milk. Blend well. Pour the batter into the ramekins over the pineapple chunks. Place the custard cups in a large baking pan and pour about 1 inch of hot water into the larger pan. Bake for 45 to 50 minutes, or until a knife inserted in center comes out clean. Serve the individual pudding cakes with spoons. Top them with whipped cream or whipped topping.